We all want bigger screens for increased impact, because larger TV screens, like high-quality 5.1-channel surround sound systems, pull us into the movie action or TV show's story line just the way big movie theater screens and sound systems do. But a too-large TV can really overpower a room. To get the right big-screen TV for your needs, you'll need to consider screen size, the display technology, your budget, and your viewing preferences. Your seating distance will determine your sense of picture clarity and detail as well as the quality of the viewing experience. If all you watch are true HDTV images, then you can sit as close as twice the diagonal screen size-- about 8 feet away for a 46-inch or a bit more for a 50-inch diagonal screen. But sitting that close may not be practical, because until the final conversion to all-HDTV broadcasting is complete and that's at least 5 years away-- a lot of your TV viewing may well be conventional analog TV, and those images may look fairly crummy up close. (Remember early big screen TVs?) If you watch regular non-HD TV sitting too close to a big screen, you'll see all the flaws. Figure on three times the diagonal screen size as a minimum viewing distance. So if you want a 60-inch diagonal screen, you should be 15 feet away to watch regular TV and still be pleased with the picture. For HDTV or DVDs, the picture will be fantastic at that distance; you could even move your chair up closer, to perhaps 10 feet. Those futuristic and admittedly very cool plasma and LCD flat panels that are only a few inches thick are alluring, but budget, screen size, and your need for optimal HDTV clarity are big factors you must consider. To get full HDTV resolution on a plasma panel means getting a 50-inch diagonal screen, and that's expensive about $6,000 USD and up. If you are willing to abandon the flat panel and accept a more conventional box (one that's no more than 14 inches deep), you can get full HDTV resolution for a fraction of that amount. A 50-inch diagonal DLP rear-projection set that's only 14 inches deep and weighs about 75 pounds would be $2,200. And you will still get a bright, stunningly good HD picture — minus the ultra-cool flat-panel appeal, of course. If you still like the flat panel and are willing to accept good but not true HD picture quality, you can save a lot of money on a smaller LCD or plasma display. 3. Do You Really Need HDTV Resolution? Let's say you won't give up on the thin flat panel display, that you simply must have it. If you are satisfied with DVD clarity-- it's called Standard Definition (480 lines) in digital TV lingo-- or Enhanced Definition (EDTV) with 480-line progressive scanning (480p), you can get a pleasing-looking EDTV 42-inch widescreen flat-panel display from Panasonic for about $3,000. The picture won't be HDTV, because the plasma screen will convert incoming HD signals to its native resolution, but DVDs will look great, and any programs shot in HD will look a lot better than on your old analog set. And you'll have your flat panel! Though the widescreen 16:9 aspect ratio (the ratio of the screen's width to its height) is the HDTV standard, and matches most movies on DVD and HDTV programs, there are still lots of TV series and news shows shot in the conventional, squarish TV shape of 4:3. Give some thought to the ratio of material you watch, and whether you'd prefer a digital HD 4:3 set that will display conventional TV programs full-screen, and wide-screen HD programs with black bars at the top and bottom. Remember that if you choose a wide-screen HD set, regular TV 4:3 programs will have large black bars to each side, unless you use the set's stretch mode, which will extend the edges of the image to fill the wide screen, at the expense of sometimes considerable image distortion. Some 4:3 sets also have raster compression, a vertical compression mode that maintains HD 1080i or 720p scanning lines so you get true HD clarity. You should look for that feature in a 4:3 HD set. Don't write off the familiar direct-view CRT (Cathode Ray Tube) set that we grew up with just yet. You can still get true HDTV performance with excellent picture quality, a wide viewing angle, long life (14 years or more), and a bright, contrasty picture that can be viewed in bright rooms--all for as little as $1,000. The downside, of course, is weight and bulk, and limited screen size the largest available is 36 inches diagonal. If you get a 34-inch HD Sony, Panasonic, Samsung or Toshiba, picture quality with an HDTV broadcast can be superb, the standard by which other sets are measured, and because the screen isn't all that big, non-HD programs and DVDs will still look excellent. If you are set on a big HD screen and you don't want the hassle of a front projector that requires a totally darkened room, then a rear-projection TV (RPTV) is a logical and in some instances a more economical choice. Most RPTV sets will get you true HD picture resolution, and will cost much less than a 50-inch plasma HD flat panel. Least expensive are the big and bulky CRT rear-projection sets, available in a wide choice of screen sizes, from 40 to 80 inches diagonal, almost all in HD versions with 16:9 widescreen displays. These use three CRT tubes, red, green and blue, one for each primary color, that must be regularly aligned or converged if the images are to remain sharp and free of colored halos or fuzzy borders. Most sets have an auto-convergence circuit that lets you do it yourself, or you can bring in a technician to fine-tune it for you for several hundred dollars. Like direct-view HD CRT sets, rear-pro CRTs are very heavy and have considerable depth. The image looks its best in a dimly lit room, and at increasing angles the screen typically becomes dim or darkish. Uniform brightness over a wide viewing angle is not a virtue of CRT rear-pro sets. Lifespan on average is about 7 to 10 years. 7. DLP or LCD Rear Projection? Unquestionably more technically exciting and less bulky, these two new rear-projection TV displays all share a number of advantages over CRTs, but they are also more expensive. The biggest advantage is that they never need convergence alignment so are essentially maintenance-free, except for the projector bulb. Both use a fairly expensive user-replaceable projector bulb as the light source, which is claimed to last from 3,000 up to 8,000 hours. 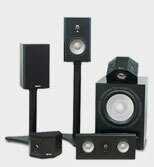 Replacement cost varies between $300 and $500, depending on the brand of the set. DLP sets produce a very bright, sharp picture viewable in normal room light, with excellent black levels, almost the equal of a CRT set. So far, in my judgment, the best-looking DLP displays are from Samsung, Panasonic, and Toshiba. Prices begin at about $1,800 or less for a 46-inch DLP RPTV. DLP sets use a Texas Instruments 1280x720-pixel chip that yields excellent HD clarity. With DLP rear-projection sets, the picture tends to get noticeably dimmer at extreme viewing angles (this does not occur with DLP front projectors). And about 10% of viewers see rainbow effects with DLP sets streaks of color when they move their eyes quickly while looking at the screen, although newer sets with faster color wheels are said to be essentially free of these effects. LCD rear-projection sets are also getting very good indeed, especially the LCD RPTVs from Sony (the Grand WEGA sets) and Hitachi, with black levels much better than in the past and close to that of DLP sets. HD resolution and sharpness is comparable to DLP, even better with some sets, with perhaps a bit less overall contrast than DLP. Like DLP, no convergence or maintenance is required, except for bulb replacement. Lifespan of DLP and LCD RPTVs is unknown, as the technology is too new, although in theory they should last at least as long as a typical CRT RPTV. Liquid Crystal on Silicon (LCoS) is a new display technology that always seems to be showing great promise, with the potential to yield even finer resolution and clarity than LCD or DLP. But to date there are very few LCoS models available and Toshiba, which had introduced several LCoS sets, has since abandoned the technology in favor of DLP. LCoS also is more expensive than DLP or LCD. 9. Can You Live With Front Projection? 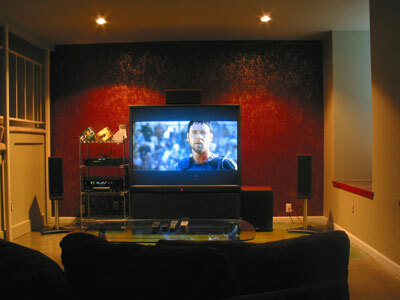 The impact of a huge movie-theater-like widescreen image is undeniable, but using a front projector requires a dark room, or the projected image will looked washed out, with poor blacks and no shadow detail, because the ambient room light falls on the screen. If your room can be totally darkened then a front DLP or LCD projector can be relatively affordable and convenient, with quite stunning picture quality. All DLP or LCD front projectors are remarkably compact and come with zoom lenses which, within limits, let you adjust the image size to the screen and viewing distance. If you will accept EDTV clarity, you can get a DLP front projector from InFocus for less than $1,000. True HDTV in a DLP or LCD projector comes with a much higher price tag. Think $3,000 and up. With either type of projector, remember to include the cost of a good-quality screen, which may run $500 or more. And if you want it to electrically descend and roll up, the cost goes up, about $1,000 or more. Using the wall for projection purposes is possible with special screen paints, like Screen Goo. The highest-quality HDTV signals are available from satellite or HD digital cable-boxes. 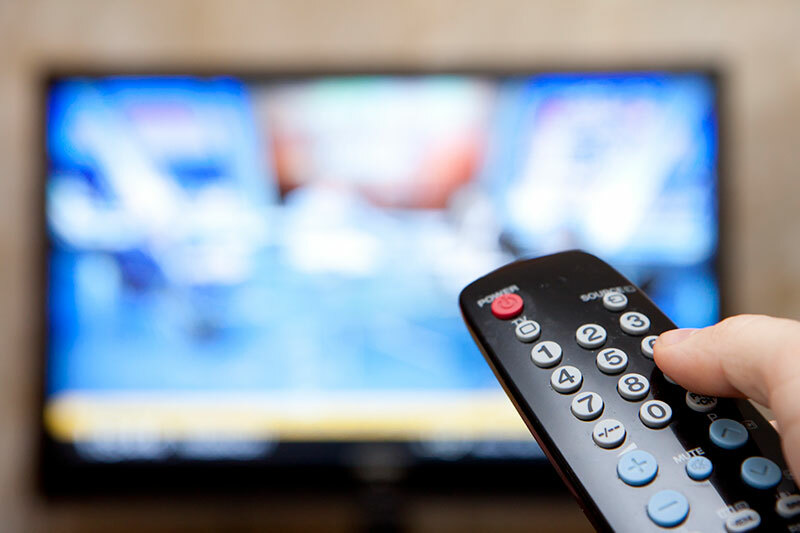 With either of these, the satellite receiver or set-top digital cable boxes will receive and decode HD signals as well as analog TV stations carried by the cable system, so you won't need a separate HD tuner built into the HD set you purchase. However, you may be within range (30 or 40 miles) of terrestrial digital HDTV over-the-air broadcasts, which of course are free but you must have an HDTV tuner to receive them. All HDTV sets manufactured since March 2005 must have built-in HDTV tuners. If you have an earlier HD display, you may need to buy a separate HD tuner for over-the-air HD broadcasts. 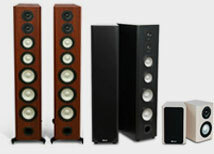 Pictured above, the M2 bookshelf speakers for home in Cherry wood with a clear finish. 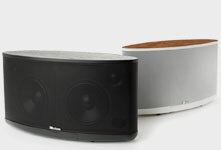 It can be confusing, we know - how do you know which are the best speakers for home use? 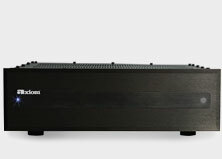 Are there characteristics about the best speakers for home stereo which are distinct from those that are best for home theater? In a word, no! The best speakers for any use around your house will share the same key traits: The sound will be neutral - not 'warm' or 'mellow' or 'soft' - what you really want is 'accurate'.